The PHORCE USB3.0 Fiber Extender was designed to extend the SuperSpeed USB3.0 connections beyond the typical 3 meter reach limit of copper cables, the unique feature of PHORCE family is its transparent operation. The connected remote USB device appears as local device to the host PC. 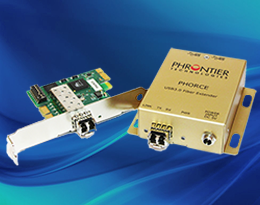 PHORCE system consists of a PHORCE-PC card, which is installed in the PCIe slot in the host computer, and a PHORCE-RE box, which provides two USB3.0 root hut ports at the remote site of the application. The remote USB ports comply with USB3.0 specifications and are backward compatible with USB2.0 devices and platforms. PHORCE also works with USB3 Vision cameras for machine vision applications.